In so many different ways, J.J. Abrams’ Star Wars: The Force Awakens tried to capture the tone and intent of the original Star Wars trilogy without blatantly copying exactly what was done in Star Wars: A New Hope. There was one fantastic reference to the original Star Wars, though, that Abrams couldn’t resist. You saw when Finn (John Boyega) was playing around on the Millennium Falcon, how the chess board returned? Well, the man behind the chess board came back, as well. [The designs] were over at the Lucasfilm archives, so we went over there and engaged in a pretty protracted reconstruction process where we used a process called photogrammetry to capture the disintegrated puppets in their current state, and that allowed us to put them in the computer and to reconstruct them. Those went to the 3D printer and the molds were made and cast in the various rubber and plastics. That’s where a tremendous amount of time went, was in the reconstruction. The stop motion process was pretty much the same, except we were shooting on digital cameras instead of film. 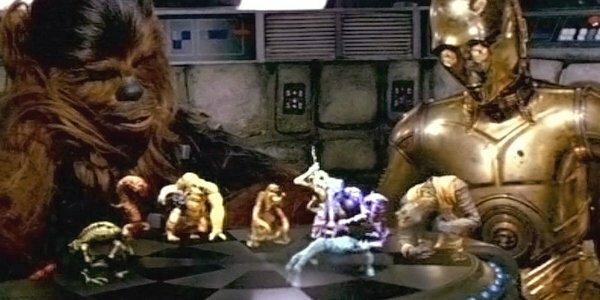 The process of reconstructing the original chess set was much more elaborate initially, where Jon Berg and I created… [It] was just a matter of weeks, the very last thing in the production process on the first Star Wars movies. Kind of an afterthought of George [Lucas]’s. The reconstruction process for J.J. Abrams was much more elaborate, you know. We had, the reconstructing, took way more time than doing something original in the first one. And now you have a better idea of the amount of time and effort that went into the replication of a tiny moment from The Force Awakens.